6 months back all I could think of was to put up a few tried recipes and some serious journaling of my boring life. Then Time happened. And along with time, 99 posts happened. These two changed my priorities, wants and needs. Now I disarmigly try n concoct recipes and formulas, view my once mundane life with a story in every moment, capture those timeless-fleeting occasions in my heart as well as in words, be fascinated with pixels and ISO settings, play around with picasa and instagram, make new friends and the best bit – wake up to ‘likes’ and kind ‘comments’!! Life has been fun since. 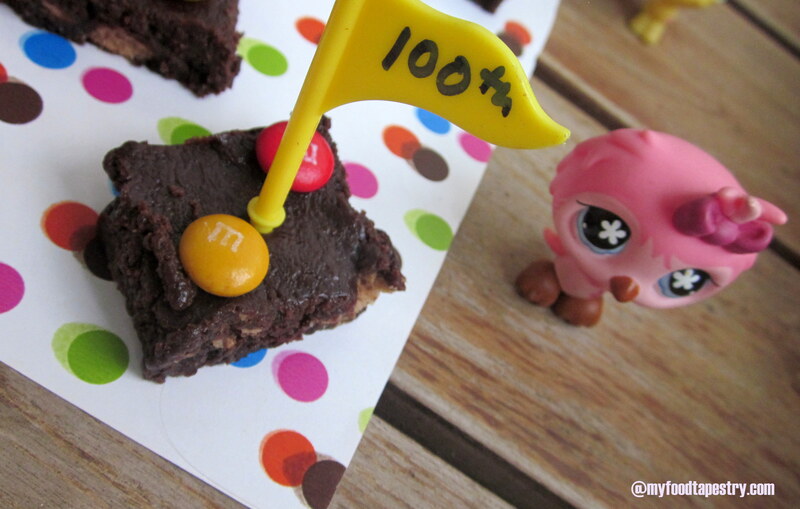 Exactly 6 months and 99 posts later, I bring this sweet delicacy for you dear foodies to celebrate my 100th post. 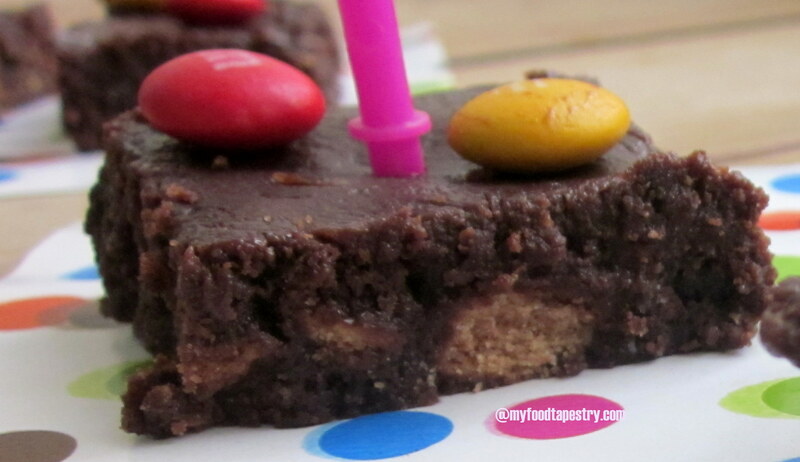 Biscuit Chocolate Fudge, a gooey-chewy soft sweet mouthful – a perfect way to enhance my festive spirit. Milee was already celebrating. Not my 100th post dear friends. But ‘Friendship Day’. Frankly, I never got around understanding all the special days that come in a year – friendships day, women’s day, father’s day, mother’s day, wife day, this day, that day. Phew! tiring. But the child’s zest and spirit to make friends and share threads of amity made me tickle her demands of little friendships bands and some chocolate candies. It might sound strange, but I never made a band for my friends to declare and pledge my loyalty towards them. And others around me did it and were subject to ‘Hmph, so silly’ looks. But like said before, Time taught me to never say ‘never’ again. My kid, who has a very fine mind of her own and she makes that very clear, announces loud that she needs those threads for all the people on her list. The girl was on a mission, I could make that out. And now a little word on Milee’s social skills. My kid is sensitive, touchy and easily offended. Comradeship doesn’t come easily to her. She usually gets left out or kicked out from games and teams. We can see she is eager to make friends and join in all the fun, but the kid struggles with social skills and team spirit. Hmm… so now her agenda was to bribe her way into games and groups. 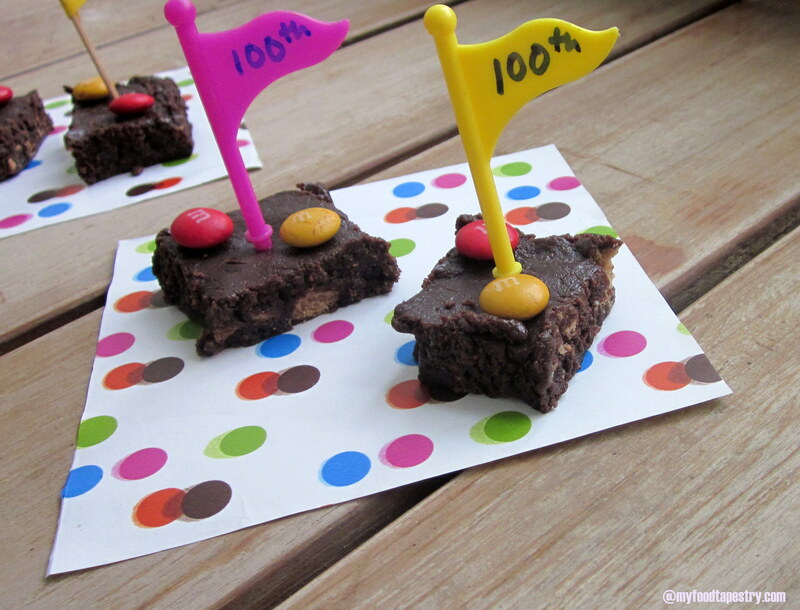 Well..I could not say no, and moreover I needed a sweet treat to ceremonialize my 100 posts. The band making project turned quite a dampner when we realized crocheting threads is no joke. We struggled, wasted and finally flung the thin satin yarns. Leaving a room full of fine threads, scissors and lots of mess for another time in the day, we enter the kitchen in lieu of creating some magic there at the least. The recipe simple, the ingredients ready, the zest back, we set to work. And it works like a charm. Mix the condensed milk, cocoa powder and butter to a smooth paste in a pan or kadai/wok. Place the mixture on low flame and while stirring all the while, cook for at least 10-12 minutes. You will find it thickening and becoming one cohesive mass. Once done. Throw in the coarsely crushed biscuits. Mix well. Pour the contents into a well greased plate. Let it cool. 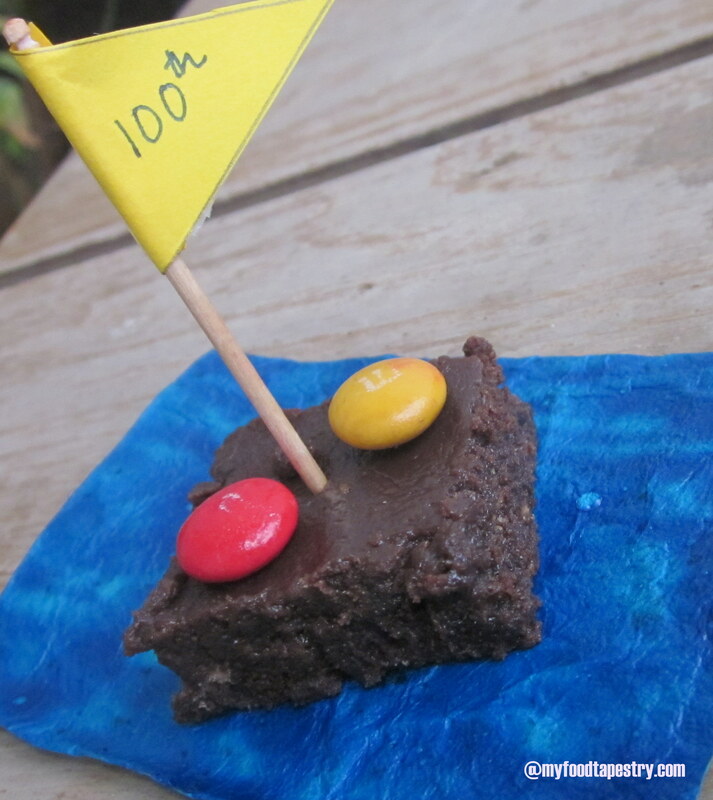 I refrigerated it once the fudge had cooled down. 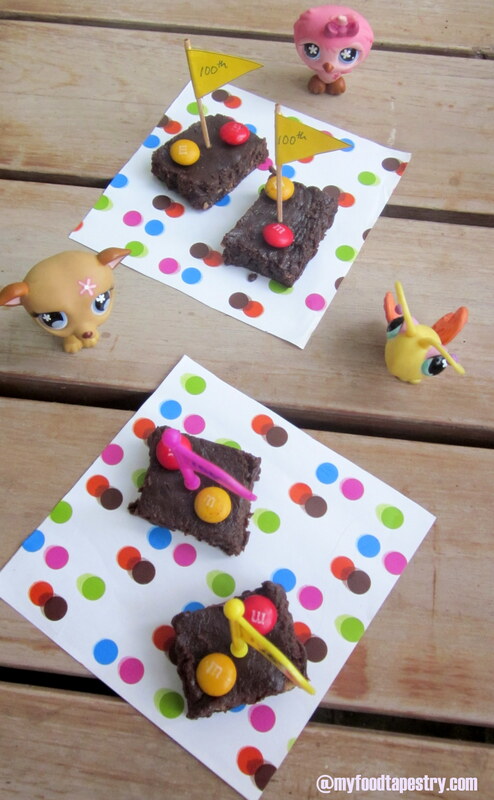 After a couple of hours, remove, cut into square pieces, decorate with MnM’s or gems. Keep the rest refrigerated else it starts to get all sticky and melty. We later did get back to the band making project. And we did complete it, though with not any outstanding results. But it pleased Milee like no other. She was very proud of her handi work, joyous about the little goodies cooling in the fridge and hopeful of all those beautiful relationships she was going to make. No, I am no witch. I didn’t burst the bubble that was floating so high up in the air. I let her dream. I let her hope. I let her be. And with this new-found hope that both mother daughter found, we embark on our respective journeys with similar roads to travel and familiar destinations. So, here’s one, for many more to come. This post is going to be a short one. Hopefully. When I sit to write, the river of words just gushes forth as if waiting for the dam to be opened. I try so hard to write small. But its all in vain. So today since I am already short on time, I have promised myself to keep it short, sweet and simple. 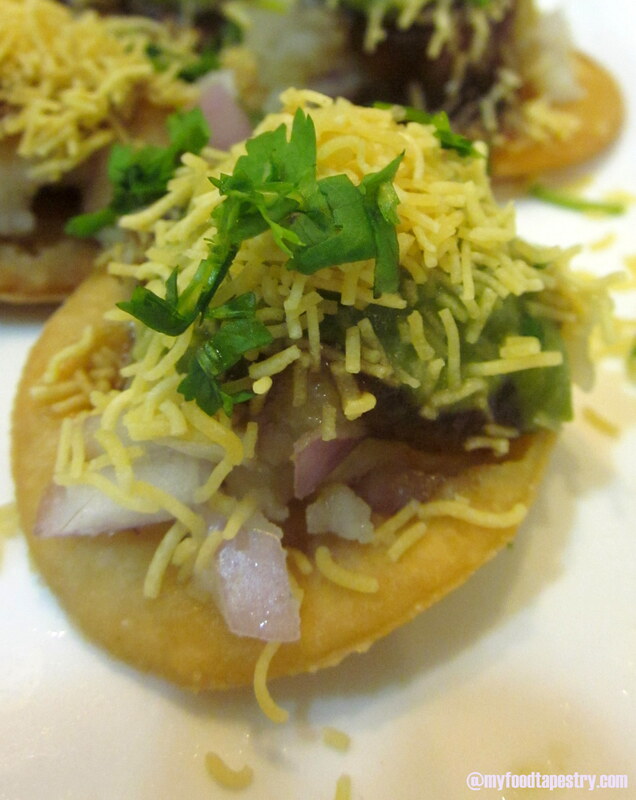 We jiffed up this chaat when I made the tamarind dip. But completely forgot about posting the assorted dishes made on that day using the amazing, very versatile tamarind dip. Oh Well! Better late than never. 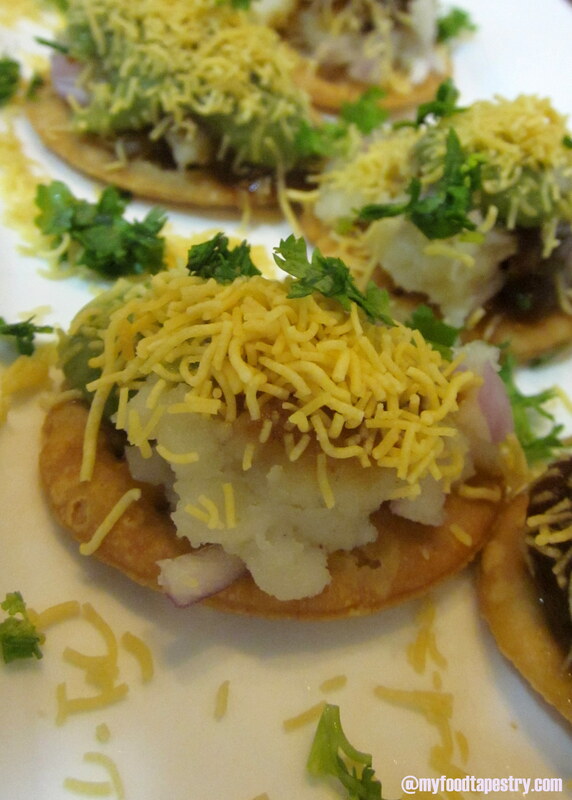 As you know, “chaat” is a big hit in my house. the father daughter duo can thrive on it for dinner everyday. Of course, I don’t give in to their demands. 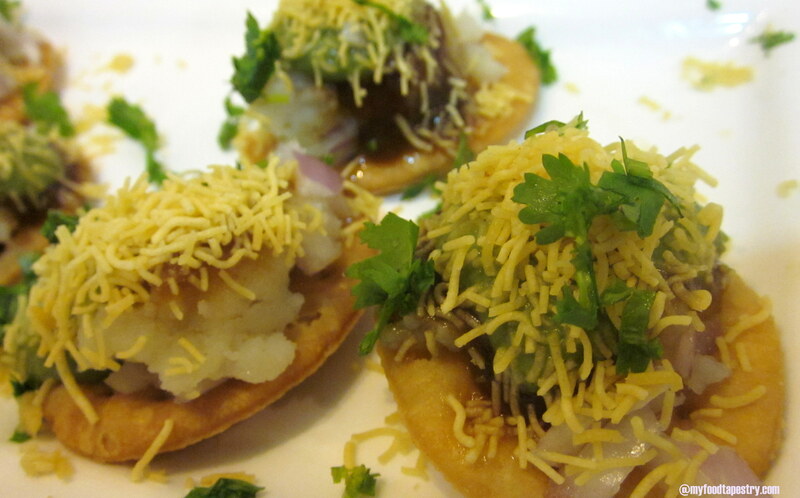 Chaat is Indian Junk street food. So we indulge, but once in a while. 2 tbsp any bundi namkeen – very hard to describe in English :(.. so sorry. Arrange the puris on a flat serving plate or tray. Mix the boiled potato, onion, little coriander leaves, the bundi namkeen and if you are using tomatoes, then add them too. Sprinkle little chaat masala. Mix well. Keep aside. Now to each puri, drop a bit of the above mixture, just enough to cover each puri. Dab the chutneys, one by one. Sprinkle chaat masala and lime juice. 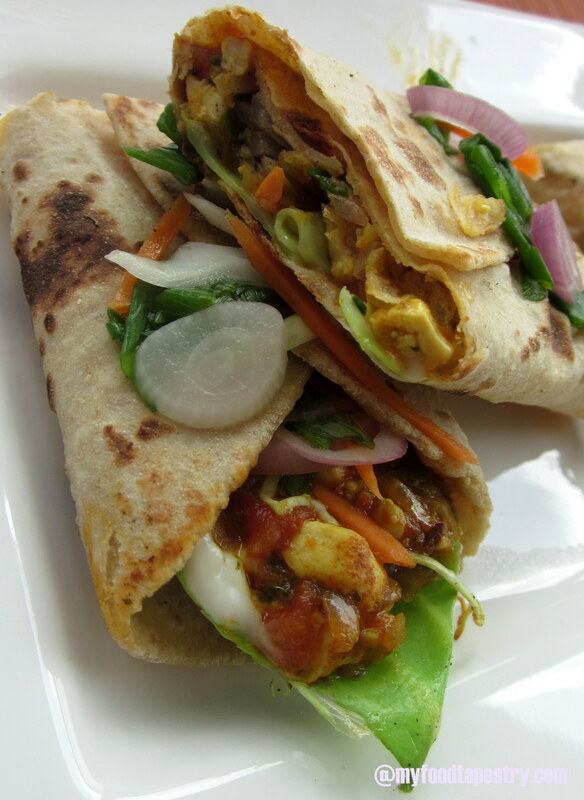 Garnish with sev and coriander leaves. Serve immediately, else the toppings soften the puris up. 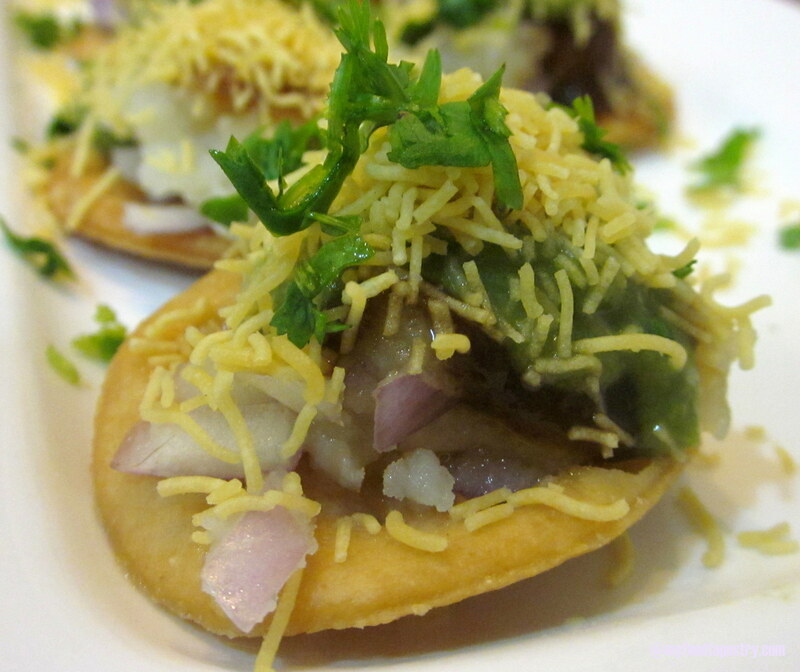 In Mumbai, garlic chutney is added to most chaat dishes. A wee bit brightens the plate. Husband is a big sucker for garlic chutney. But since I did not have it on that day, we made the chaat sans garlic. If you have it in your pantry, do dab a bit and tantalize your taste buds. Is it short enough?! 🙂 Yay! Thank me for not boring you today. Just for today. 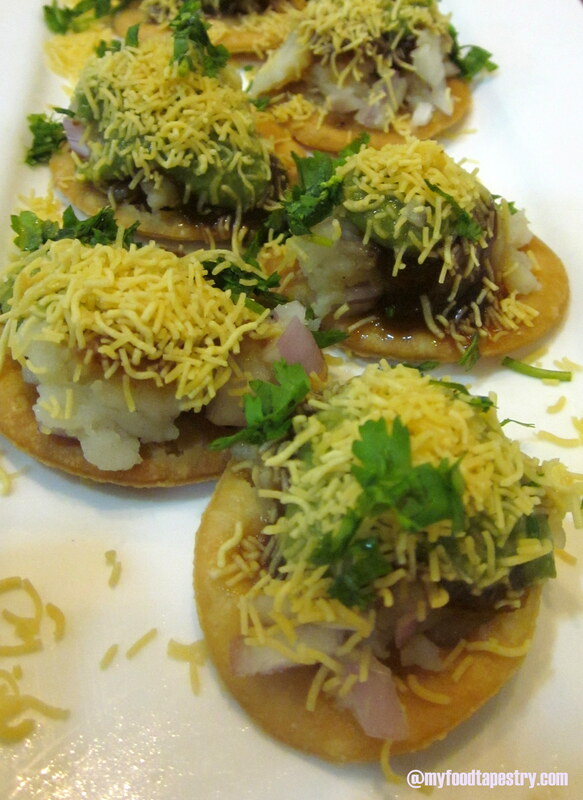 This post is my entry to Vardhini’s(of CooksJoy) Chaat and Chutneys Event. I was bored. Bored out of the routine which had not altered for the past few weeks. Bored out of doing similar things at similar timings – daily. I needed a break. Taking a sabbatical from work and home means going out and enjoying a scrumptious meal with family… but I was bored of that too! Fussy me. Lethargic dull company can have widening effects on you. So said the husband. Woken up all peppy and permeated with new found vivacity, he thought he could infect me too with it. It didn’t. I stay as dull as dishwater. After much coaxing-haggling we decide to role reverse for the day. Great as a take away. The guy would chip in with Milee, make lunch, do laundry, get the house to sparkle and I? Oh I was to just lie on the couch, watch TV, lick Nutella, make a mess around me and then doze off to candy land. (I secretly wish for a place really made out of chocolate – where ganache flowed, trees sprouted choco bars, flowers bloomed into candies, clouds were made of cotton candy and houses of dutch truffle – sigh!). But somethings are just not meant to be. Just when I put my feet up, just when I start to enjoy the reruns of Suits(Harvey Specter — I love you). Just when I haven’t even licked the spoon clean… dishes fall, water spills, kid goes hungry, maids lament…the kitchen turn into a mini battle field. Oh! my insouciance go-to-hell. Drowsy my foot! Husband has a knack of waking me up even if I were in a grave. Shutting the TV off, I return to my territory with such a look that puts the inept to shame. Taking in all the annihilation, seething with rage, secretly cursing my diminutive brain for not foreseeing the future. I set to work. Resolved not to forgive, I plotted to desecrate our Sunday. But fate was not on my side that particular day. Again. The lunch turned out fabulous. I didn’t want it to be. It turned into a treat. I didn’t want it to be. I Sulk. And more sulk. The dad daughter duo enjoyed every last bite, while I scowled to the last bit. 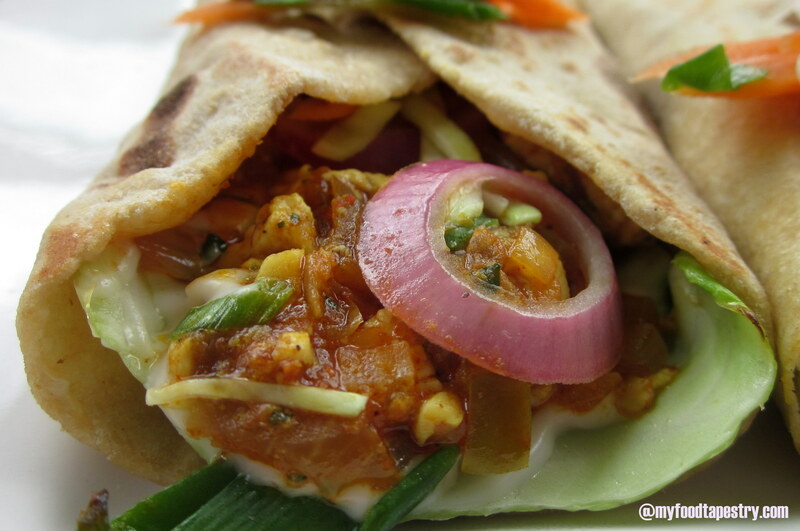 Crunch from the veggies and the melt from the paneer… goodness in every bite! Soak the salad veggies in lime juice, vinegar, salt and pepper. Keep aside. 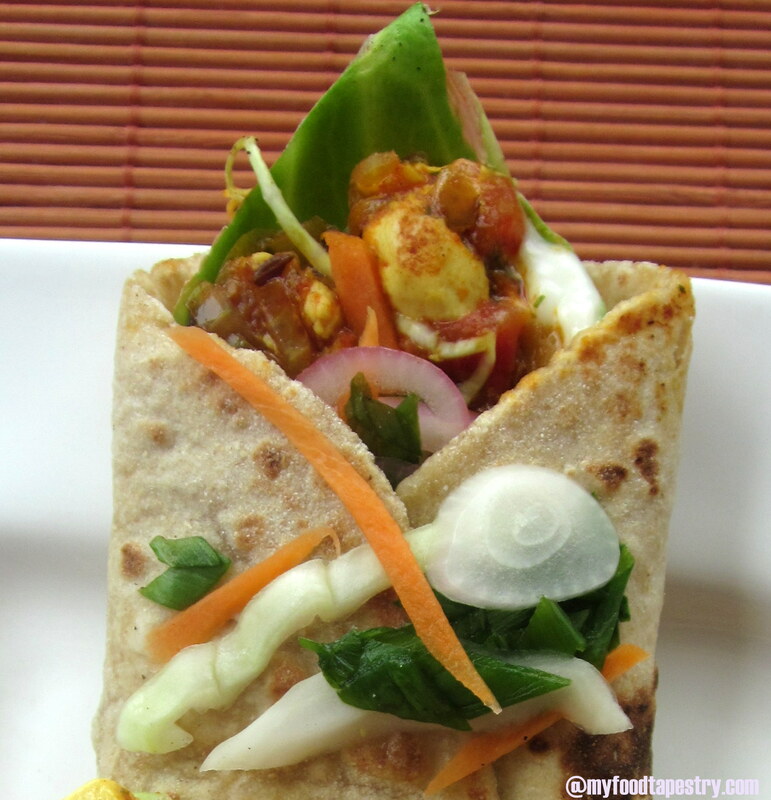 Take a chappathi, place lettuce on it. Smear a tbsp of mayonnaise on the lettuce. 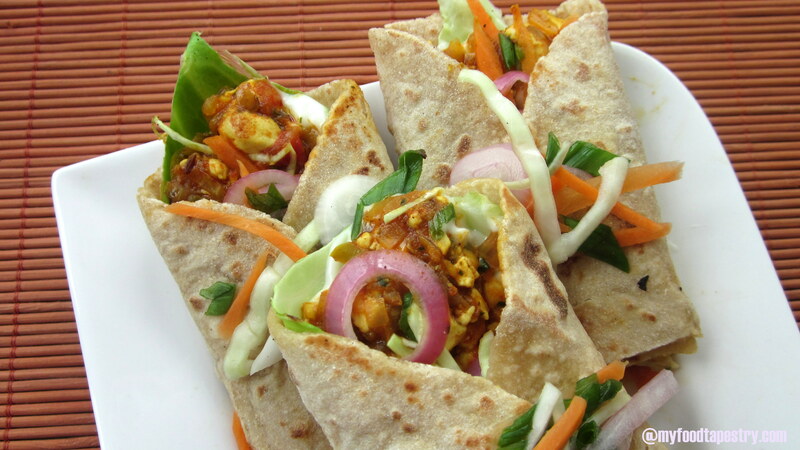 Place a table spoon or more of paneer bhurji in the center of the tortilla. Now, top the bhurji with shredded soaked salad veggies. If using chat masala and cheese. Add it on the salad veggies now. Fold from both sides tightly. Pick the entire assembly up with a flat spatula. Roast on a hot flat griddle till toasted and crisp. If you like you can use a little bit of olive oil for toasting it. Serve hot with a lot of extra salad and something cool to sip on. 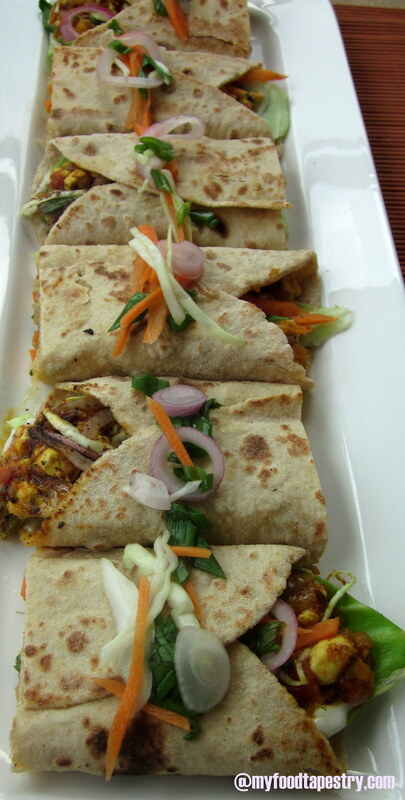 Bhurji is a term used for crumbled paneer in a tangy spicy tomato onion gravy. The paneer is mashed and soft. 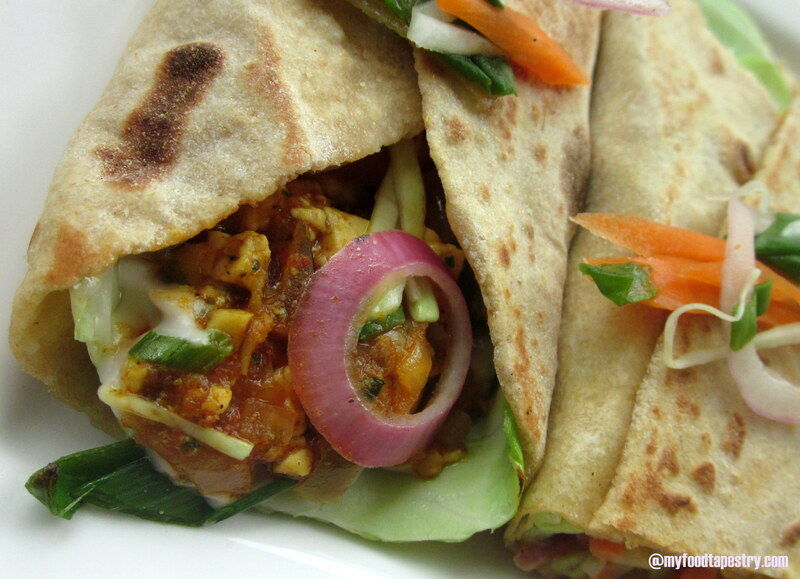 It serves as a great side to chappathis/wraps and on breads. First, crumble the paneer(FUN!!) and keep aside. I didn’t crumble actually, I minced it. 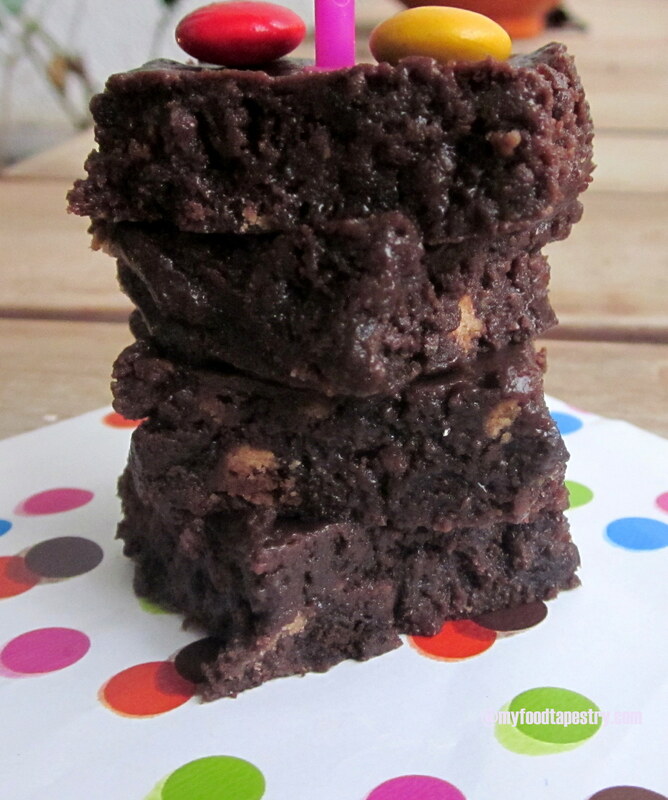 Little tiny perfect squares. But it doesn’t matter if u crumble or mince them. Heat oil in a pan. Crackle cumin seeds. Saute ginger garlic paste. Add in onions-green chilies. Saute till pink. Next throw in the chopped tomatoes, along with the turmeric, chili powder and coriander powder. Cover and cook till oil separates from sides. Once done. 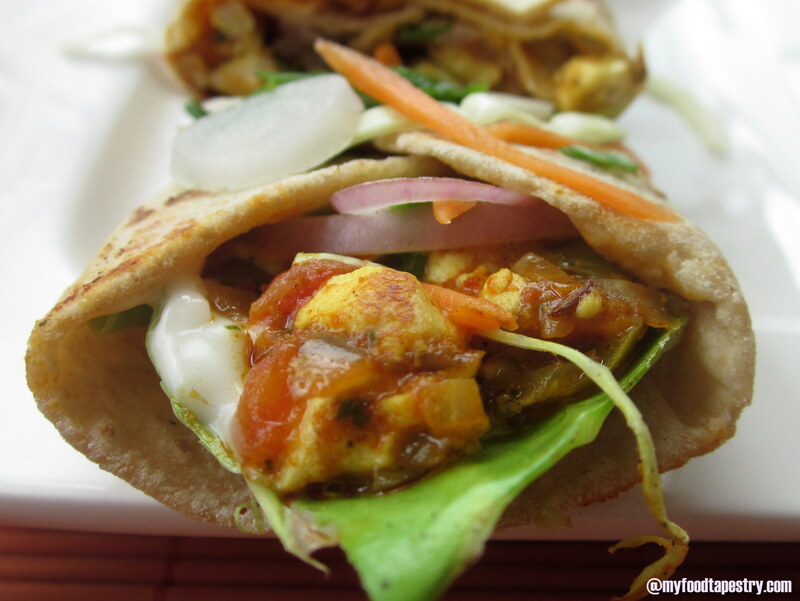 Add the paneer. Give it a good mix. The end is a cohesive mix of the gravy and the cheese. turn the flame off. Add garam masala, lime juice and coriander leaves. Mix well. Use as required. The onion turns red with vinegar and salt. Sometimes I think it’s my man’s tactic to avoid doing things that he doesn’t want to do. What I mean is, Do it badly, chances are she will never ask again. Ah! well. Whatever it is. Lesson learnt. Kitchen cleaned. Lunch done. Peace regained. All that matters. Red Bean Vegetarian Burrito and Why not to kill a Mocking Bird.